In 2015, over 1000 certified organic farms were operating in New York State (NYS Dept. of Agriculture and Markets). Nationwide, New York ranks third in number of organic farms and organic cropland harvested (USDA 2011). Of the approximately 5000 dairy farmers in NYS, about 430 are currently certified organic. This number is expected to rise to 500 within two years (Fay Benson, Cornell Cooperative Extension, personal communication). Thus 10% of NYS dairy farms will then be organic. However, organic grain production has not kept up with demand, and well over half of feed grains sold to New York livestock farmers are from out of state (Mary-Howell Martens, Lakeview Organic Grain, personal communication). Consequently, land-grant university research is needed to support more organic feed and forage production in NYS. 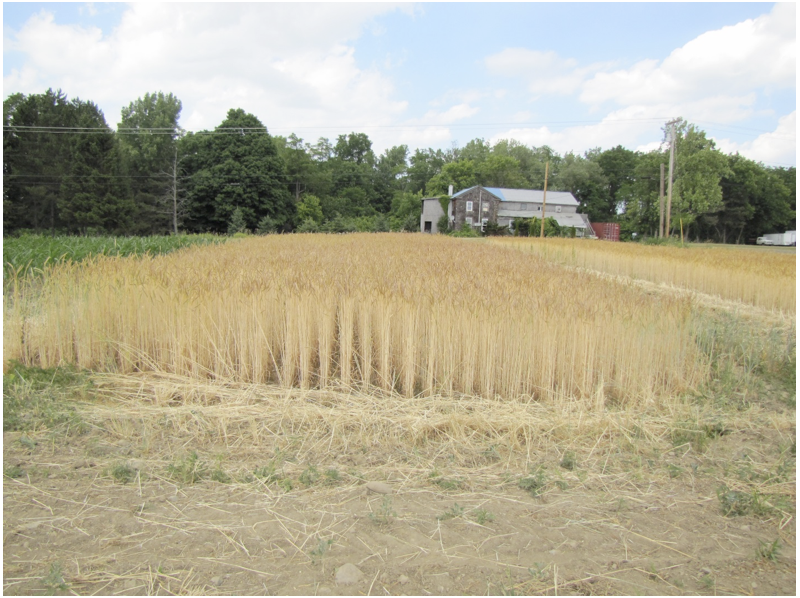 The Cornell Organic Cropping Systems Grain Experiment (OCS) was initiated in 2005 at the Musgrave Research Farm in Aurora, NY. The purpose of this long-term experiment is to compare four approaches to organic production. Results from 2005-2010, including the 3-year transition period, were documented previously (Caldwell et al. 2014). This article discusses recent findings from the experiment and its future prospects. The OCS compares organic cropping systems: high fertility (HF), low fertility (LF), enhanced weed management (EWM) and reduced tillage (RT) organic cropping systems. We consider them systems because they are different in multiple ways. They have evolved over time to address production challenges with help from our organic farmer advisory board. Currently, HF employs higher nutrient additions during each rotation than the others, and uses both belly-mounted and rear-mounted cultivators. 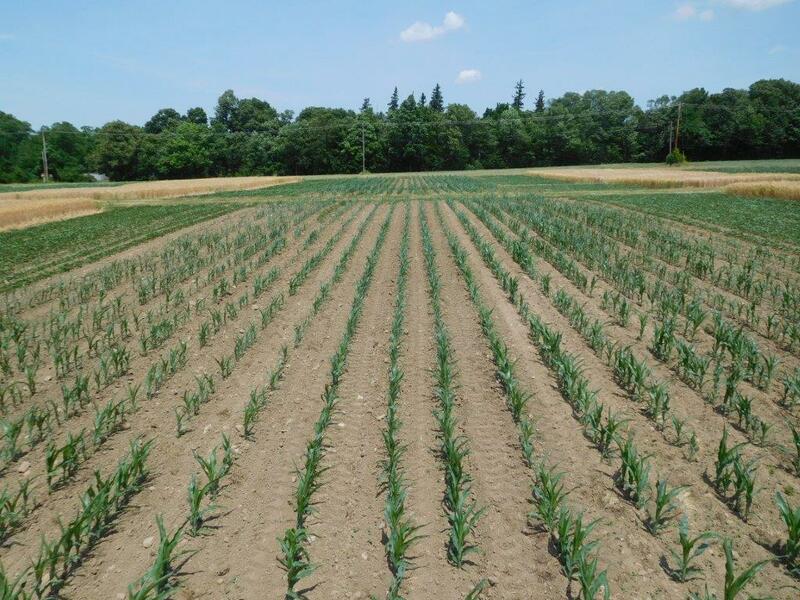 LF receives only corn starter fertilizer once during every 3-year rotation and only rear-mounted cultivators are used. EWM has an intermediate nutrient regimen and employs both types of cultivators, short tilled fallows, and extra cultivation to reduce weeds. In contrast to the moldboard plow-based tillage program of the other systems, RT uses a mixture of deep zone tillage, ridge tillage, and chisel plowing depending on the crop. It has an intermediate soil nutrient regimen. rotation for the first six years (RT used other legumes instead of red clover in the spelt year). A group of local organic farmers and extension educators advise on the management of this experiment. In essence, a double crop of winter barley and buckwheat was substituted instead of corn at year 4 (2013 for EP A and 2014 for EP B). This enabled extra mid-season tillage to reduce weeds, particularly perennials. It also meant that no red clover was grown that year. In the other years of the rotation, crops were similar to those in LF and EWM. Figure 1. Weed biomass in soybeans before and after 2013-2014 crop years, average of entry points. Results from 2005 to 2010 were reported in Caldwell et al. (2014). Briefly, applied organic chicken manure compost increased spelt yields but not corn yields. The LF system had the best overall financial returns. Corn was a poor choice during the transition period to certified organic production, but soybeans performed relatively well and spelt was intermediate. After the transition period, corn yields increased and were similar to Cayuga County averages. Organic crops with an arbitrary 30% price premium (chosen to reflect a conservative value) were more profitable than analogous conventional crops with County average yields. In recent years, the organic premium for corn and soybeans has often been higher than 30%. Currently (7/8/16) it is over 100% for corn and about 50% for soybeans (USDA, Chicago Board of Trade). The current six-year cycle, starting in 2011, will finish at the end of this season for both entry points. HF and RT will complete one 6-year rotation and LF and EWM will complete two, 3-year rotations. The period 2011-15 was marked with a dry July (2011) and August (2012) and two very wet Junes (2013 and 2015). OCS stands were poor and areas of crops were severely stunted in 2013 and 2015 due to insufficient drainage, but crops tolerated the dry spells. Figure 2 shows yields of OCS crops over the period. Yields were normalized as a percentage of Cayuga County (if available) or NYS average yields for each year and crop, then placed in two groups based on wet or “normal” years. Buckwheat yields were not included due to lack of State or County averages. In 2011, 2012, and 2014, yields were close to County averages for the conventionally tilled systems, whereas in 2013 and 2015 they were quite reduced. The RT system had about 60% of County yields in all years, regardless of June precipitation. In the wet years, the low fertility system was affected most severely. Figure 2. OCS yields, 2011-2015. Buckwheat not included due to lack of published County or State yields. “Normal” years were 2011, 2012, and 2014. Wet June years were 2013 and 2015. In 2015, 8 inches of rain fell in June, whereas in 2016, the June total was only 0.74 inch, the lowest growing season monthly precipitation during this experiment. It appears likely that such extreme weather periods will be common in the future. Our results indicate that under organic management on this soil type, higher nutrients can ameliorate some of the negative effects of excess rainfall. The extremely dry June of 2016 was preceded by a dry May, and drought continued into July. Whereas the winter spelt crop looks excellent in HF, EWM, and RT as of this writing, corn growth has been slowed dramatically. Corn harvest this fall will give us insight into whether any of these systems are better able to withstand severe dry spells. Figure 3. Spelt prior to harvest in the High Fertility (HF) system on July 5, 2016. 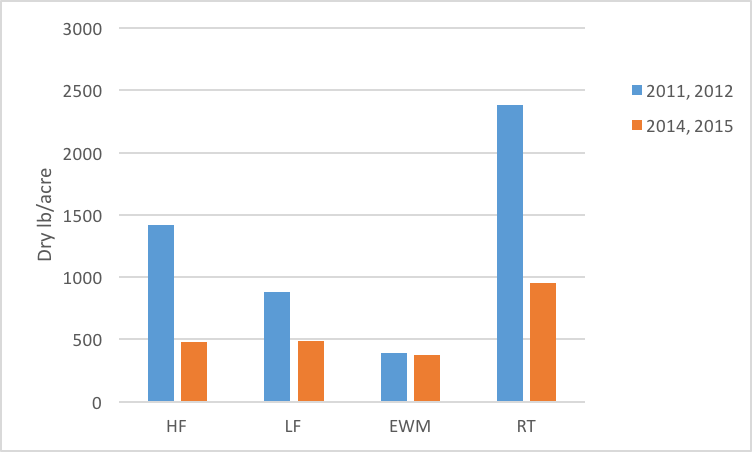 Weed biomass was reduced in HF and RT after the barley/buckwheat year in their expanded rotations (Figure 1). Whether weed biomass will remain lower in these systems is not yet clear. However, this strategy under our constraints was likely unprofitable. The introduction of new crops such as winter barley and buckwheat into the crop mix often requires new equipment and knowledge. Our buckwheat yields in particular were low because of equipment limitations and unfamiliarity with harvesting this crop. Local organic buckwheat farmers often use a swather and combine pickup head to harvest buckwheat. The swather mows and gently windrows the buckwheat, allowing it to remain in the field to fully mature and dry. The windrows are then gathered into the combine using the pickup head. Instead, we direct-harvested the crop, a method that can result in field losses (Bjorkman 2010). Similarly, our inexperience with barley also resulted in some harvest losses. Although we have not yet put together financial budgets for these crops, net returns for the barley and buckwheat with our yields would likely have been much lower than those from corn achieved in LF and EWM in corresponding years. Our experiences mirrored those of many farmers when starting out with new crops. This new phase of the Organic Cropping Systems Grain Experiment will explore scenarios and issues that we and our advisors anticipate will impact farmers in our region in coming years. Bjorkman, T. 2010. Buckwheat Production: Harvesting. Agronomy Fact Sheet 51. Cornell Cooperative Extension. Ithaca, NY. Caldwell, B., C. L. Mohler, Q. M. Ketterings, and A. DiTommaso. 2014. Yields and Profitability during and after Transition in Organic Grain Cropping Systems. Agron. J. 106:871-880. Schipanski, M.E. & Drinkwater, L.E. 2011. Nitrogen fixation of red clover interseeded with winter cereals across a management-induced fertility gradient.NutrCyclAgroecosyst 90: 105-119. Organic soybean (July 27) during the dry 2016 growing season has not canopied or filled in completely, especially with the recommended seeding rate (6 rows on the right), which may allow for some late-season weed escapes to affect soybean yield. We initiated a 3-year study at the Aurora Research Farm in 2015 to compare different sequences of the corn, soybean, and wheat/red clover rotation in conventional and organic cropping systems under recommended and high input management during the 3-year transition period (2015-2017) from conventional to an organic cropping system. 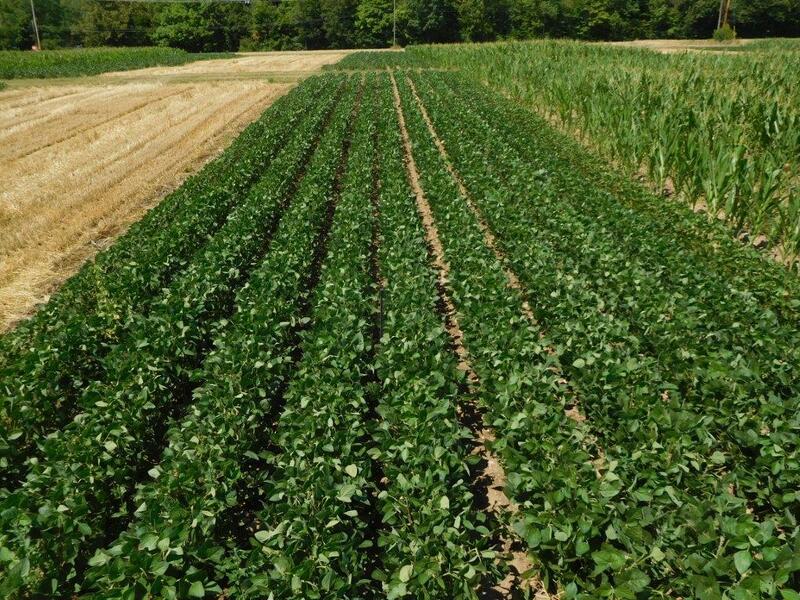 We provided a detailed discussion of the various treatments and objectives of the study in a previous soybean article (http://blogs.cornell.edu/whatscroppingup/2015/09/16/emergence-early-v2-stage-plant-populations-and-weed-densities-r4-in-soybeans-under-conventional-and-organic-cropping-systems/). This article will focus on soybean emergence (days and %), plant densities at the 2nd leaf (V2 stage), and weed densities at the early pod (R3 stage) in 2016. Corn preceded soybean in the rotation in this study. Despite the dry spring conditions (1.9 inches in March, 1.87 in April, and 0.75 inches from May 1-19), ideal soil conditions prevailed for plowing on May 19 (full soil water profile in contrast to corn that followed red clover that had very little stored soil water in the top 8 inches). The fields were then cultimulched on the morning of May 20, the day of planting. We used the White Air Seeder to plant the treated (insecticide/fungicide) GMO soybean variety, P22T41R2, and the non-treated non-GMO, 92Y21, at two seeding rates, ~150,000 (recommended input) and ~200,000 seeds/acre (high input). Unlike the corn comparison, P96Y21 is a not an isoline of P22T41R2 so only the maturity of the two varieties and not the genetics are similar between the two cropping systems. As with corn, we treated the non-GMO, 92Y21, in the seed hopper with the organic seed treatment, Sabrex, in the high input treatment (high seeding rate). Unlike corn, however, we used different row spacing in the two cropping systems with the typical 15” row spacing in the conventional cropping system and the typical 30” row spacing (for cultivation of weeds) in the organic cropping system. Consequently, the soybean comparison is not as robust as the corn comparison for emergence and early plant establishment because of the different row spacing and genetics between the two cropping systems. We applied Roundup (Credit 41) at 32 oz. /acre for weed control to conventional soybean at the V4 stage (June 22) under both recommended and high input treatments. We used the tine weeder to control weeds in the row in both recommended and high input organic treatments at the V1-V2 stage (June 9). We then cultivated close to the soybean row in both recommended and high input organic treatments at the V3 stage (June 15) with repeated cultivations between the entire row at the V4 stage (June 22), beginning flowering (R1) stage (July 1), and full flowering (R2) stage (July 14). The high input soybean treatment in the conventional cropping system also received a fungicide application on July 27, the R3 stage, for potential disease problems and overall plant health. Weather conditions were warm and dry for the first 10 days after planting. Soybean emergence required 7 to 8 days, which was more rapid than corn emergence, probably because the lack of a green manure crop (red clover preceded corn) resulted in more soil water in the seed depth zone. 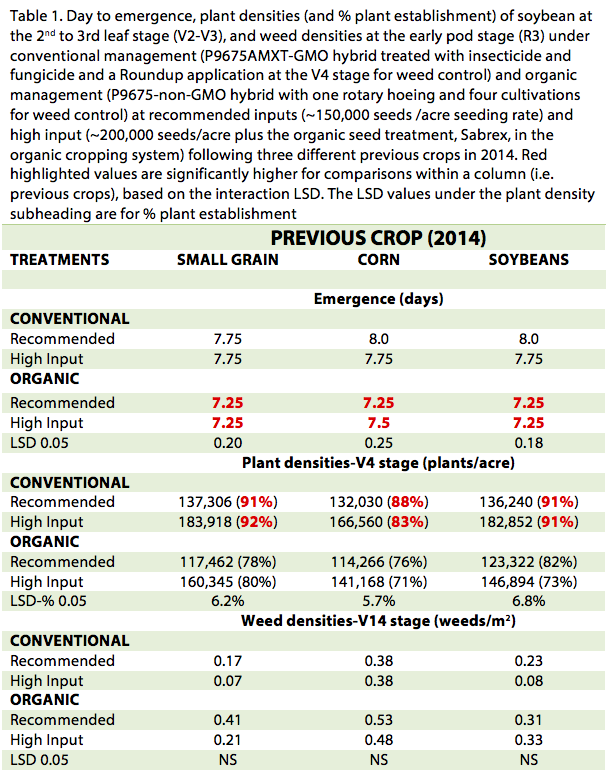 As in 2015, organic compared to conventional soybean emerged 0.50 to 0.75 days earlier (Table 1). As mentioned in a 2015 article (http://blogs.cornell.edu/whatscroppingup/2015/06/16/days-to-emergence-and-early-corn-and-soybean-plant-populations-under-conventional-and-organic-cropping-systems/), variety differences between the cropping systems probably influenced days to emergence. Pioneer rated P92Y21, the variety used in the organic system, with a higher field emergence score (8 out of 10 rating) compared with P22T41R2 (7 out of 10), which probably contributed to the more rapid emergence in the organic system. The organic cropping system also was planted in 30 inch rows so there were 8.5 or 11.5 seeds emerging through the soil in 1 foot of row in the organic system compared with 4.25 or 5.75 seeds emerging in 1 foot of row in the conventional system, which may have hastened emergence in the organic cropping system. Days to emergence did not differ between the recommended and high input treatments in the organic cropping system, indicating that Sabrex, the organic seed treatment, did not hasten soybean emergence in 2016, similar to results in 2015. We estimated soybean plant densities at the V2-V3 stage (June 13), prior to the close cultivation to the soybean row on June 15, but unfortunately after tine weeding the organic soybeans. Conventional soybean consistently had higher plant establishment rates (83 to 92%) compared with organic soybean (71 to 82%, Table 1). This was inconsistent with the 2015 data in which soybean in the organic cropping system under recommended input management had greater stand establishment than its counterpart treatment in the conventional cropping system (http://blogs.cornell.edu/whatscroppingup/2015/07/23/emergence-early-v4-stage-and-final-plant-populations-v10-psnt-values-v4-and-weed-densities-v12-in-corn-under-conventional-and-organic-cropping-systems/). In 2015, we were able to estimate plant populations before tine weeding. In 2016, we estimated plant densities after tine weeding, which probably reduced plant establishment rates because of crop damage. Nevertheless, plant densities exceeded 114,000 plants/acre in all organic treatments, the threshold density below which soybean yields decrease under typical growing conditions (http://scs.cals.cornell.edu/sites/scs.cals.cornell.edu/files/shared/documents/wcu/WCU21-2.pdf). We will estimate soybean densities again at harvest to determine the extent of crop damage during the subsequent four cultivations in the organic cropping system to determine if final stands fall below the 114,000 plant/acre threshold. As with corn, weed densities were exceedingly low in soybean in 2016 (Table 1), but even more so in soybean. As with corn, the dry soil conditions and lack of significant rainfall events required to initiate weed emergence after cultivations in the organic cropping system and herbicide application in the conventional cropping system contributed to very low weed densities. Weed densities were essentially the same between the organic (0.21 to 0.53 weeds/m2) and conventional cropping systems (0.07 to 0.38 weeds/m2) under both management systems. Such low weed densities should not contribute to yield losses in soybean in either cropping system in 2016. In conclusion, organic soybean compared with conventional soybean consistently emerged 0.5 to 0.75 days earlier in 2016 probably because of variety and row spacing differences between cropping systems. Surprisingly, organic soybean compared with conventional soybean consistently had lower plant establishment rates at the V2-V3 stage, resulting in lower plant densities. This contradicts findings in the wet 2015 spring when organic compared with conventional soybean emerged more rapidly and had higher plant densities (http://blogs.cornell.edu/whatscroppingup/2015/09/16/emergence-early-v2-stage-plant-populations-and-weed-densities-r4-in-soybeans-under-conventional-and-organic-cropping-systems/). Plant densities of ~115,000 plants/acre at the V2-V3 stage in organic soybean with recommended inputs are close to the ~ 114,000 plant/acre threshold below which soybean yields decrease under typical growing conditions. Consequently, organic soybean yield with recommended inputs could be compromised a bit, especially if close cultivation or cultivations between the rows further reduced plant densities. On the other hand, the lower plant densities may provide a yield benefit, if weather conditions remain dry during August. The dry conditions, however, have resulted in limited soybean growth in 2016. Consequently, organic soybean in 30-inch row spacing has not canopied or filled in as of July 28, which could result in some weed escapes putting on enough growth to perhaps reduce yields in a dry growing season. Nevertheless, despite uncertainty on final plant and weed densities in organic soybean, the yield potential between the organic and conventional cropping system appears to be similar, which would reinforce 2015 results when organic and conventional soybean yields were mostly similar (http://blogs.cornell.edu/whatscroppingup/2015/11/09/soybean-yield-under-conventional-and-organic-cropping-systems-with-recommended-and-high-inputs-during-the-transition-year-to-organic/). Dry soil conditions because of limited rainfall and a red clover crop contributed to early season drought stress in corn, especially in organic corn (10 rows to the left) compared with conventional corn (10 rows to the right). We initiated a 3-year study at the Aurora Research Farm in 2015 to compare different sequences of the corn, soybean, and wheat/red clover rotation in conventional and organic cropping systems under recommended and high input management during the 3-year transition period (2015-2017) from conventional to an organic cropping system. We provided a detailed discussion of the various treatments and objectives of the study in a previous corn article (http://blogs.cornell.edu/whatscroppingup/2015/07/23/emergence-early-v4-stage-and-final-plant-populations-v10-psnt-values-v4-and-weed-densities-v12-in-corn-under-conventional-and-organic-cropping-systems/). This article will focus on corn emergence (days and %), plant densities at the V3 stage, and weed densities at the V14 stage in 2016. A red clover green manure crop (~3.75 dry matter tons/acre) was mowed down on May 18. Because of the dry spring conditions (1.9 inches in March, 1.87 in April, and 0.75 inches from May 1-19) as well as the robust red clover crop, soil conditions were exceedingly dry and plow penetration was difficult in some regions of the fields on May 19. The fields were then cultimulched on the morning of May 20, the day of planting. We planted a treated (insecticide/fungicide seed treatment) GMO corn hybrid, P96AMXT, in the conventional system; and its isoline, the untreated non-GMO, P9675, in the organic cropping system at two seeding rates, ~29,600 kernels/acre (recommended input treatment) and 35,500 kernels/acre (high input). The high input organic treatment also received the organic seed treatment (in-hopper), Sabrex. We applied Roundup (Credit 41) at 32 oz. 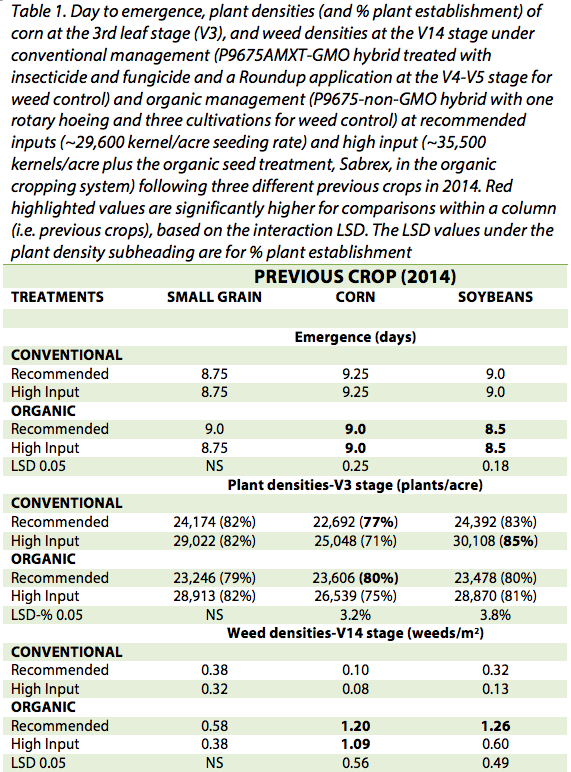 /acre for weed control in conventional corn at the V4-V5 stage (June 22) under both recommended and high input management. We used the rotary hoe to control weeds in the row in recommended and high input organic corn at the V1-2 stage (June 9). We then cultivated close to the corn row in both recommended and high input organic treatments at the V3 stage (June 15) with repeated cultivations between the rows at the V4-V5 stage (June 22) and again at the V7-V8 stage (July 1). Weather conditions were warm and dry for the first 10 days after planting. Nevertheless, corn emergence required 8 to 9 days (Table 1), or 140 to 160 growing degree days, instead of the typical 110-120 growing degree days. Presumably, the dry soil conditions at the time of planting extended the emergence time beyond the typical thermal unit requirement. Surprisingly, the non-GMO P9675, with or without the organic seed treatment (only in high input), compared with its isoline, the GMO P9675AMXT with seed treatment (insecticide/fungicide), emerged at the same time or 0.25 to 0.50 days more rapidly. In 2015, the GMO hybrid emerged about 0.50 days more rapidly than the non-GMO hybrid (http://blogs.cornell.edu/whatscroppingup/2015/06/16/days-to-emergence-and-early-corn-and-soybean-plant-populations-under-conventional-and-organic-cropping-systems/). Perhaps, the treated seed coat of the GMO hybrid reduced permeability of the scarce soil water necessary to initiate the germination process. Days to emergence did not differ between the recommended and high input treatments in the organic cropping system, indicating that Sabrex, the organic seed treatment, did not hasten corn emergence in 2016, similar to results in 2015. We estimated corn plant densities in all treatments at the V3 stage (June 14), just prior to the cultivation close to the corn row on June 15, but unfortunately after the rotary hoeing that probably reduced corn densities in the organic cropping system. Corn emergence was relatively low in 2016 (Table 1) undoubtedly because limited rainfall resulted in dry soil conditions that was exacerbated by the red clover green manure crop. Conventional corn had only 71 to 85% plant establishment, whereas organic corn had 75 to 82% plant establishment (conventional corn had 91-100% and organic corn had 84 to 97% in 2015). Consequently, conventional corn in the recommended management treatment had plant densities of only ~22,500 to 24,000 plants/acre and organic corn in the recommended input treatment had plant densities of ~23,500 plants/acre (Table 1). In a typical year, plant densities of less than ~27,000 plants/acre would result in yield reductions. In a dry year, however, plant densities of 22,500 to 24,000 plants/acre may contribute to higher yields in recommended compared with the high input treatment (plant densities of ~25,000 to 30,000 plants/acre) because low plant densities tolerate drought stress better. If soil water conditions improve after silking, the high input treatment with plant densities of ~25,000 to 30,000 plants/acre may result in higher yields. Weed densities were also quite low in 2016 (Table 1) because of the dry soil conditions and lack of significant rainfall events required to initiate weed emergence after cultivations in the organic cropping system or herbicide application in the conventional cropping system. Although weed densities were mostly higher in the organic cropping system, weed densities ranged from only 0.38 to 1.26 weeds/m2 (compared with 1.61 to 3.10 weeds/m2 in 2015), which probably will not reduce yields greatly. Weed densities in the conventional cropping system ranged from 0.08 to 0.38 weeds/m2, which indicates excellent efficacy of a Roundup application with drought-stressed weeds that emerged after the May 20 planting date and before the June 22 Roundup application. In conclusion, organic corn compared with conventional corn emerged at the same time or earlier in dry soil conditions in 2016. Likewise, organic corn compared with conventional corn generally had similar plant densities at the V3 stage, despite a previous rotary hoeing operation to organic corn, which probably resulted in some corn damage. This contradicts findings in the wet 2015 spring when conventional corn compared with organic corn emerged more rapidly and had higher plant densities (http://blogs.cornell.edu/whatscroppingup/2015/06/16/days-to-emergence-and-early-corn-and-soybean-plant-populations-under-conventional-and-organic-cropping-systems/). Similar to the 2015 growing season, organic compared with conventional corn had mostly higher weed densities but weed control in organic corn in 2016 was generally satisfactory. Consequently, based on plant and weed densities, the yield potential for organic compared with conventional corn is similar. Organic compared with conventional corn, however, had lower pre-sidedress nitrate (PSNT) concentrations (11 and 19 ppm, respectively), although both averaged less than the threshold 25 ppm that signifies adequate soil N for maximum yields. We expected much higher PSNT values because red clover dry matter production averaged almost 4 tons/acre with average N concentrations of 3.35%. Apparently, the exceedingly dry soil conditions minimized N mineralization of the N in red clover. Organic corn also had PSNT concentrations of ~11 ppm in the wet 2015 growing season, which underscores the difficulty of providing adequate N for organic corn, as indicated by the 20 to 40% yield reductions in 2015 because of inadequate N (http://blogs.cornell.edu/whatscroppingup/2015/11/09/corn-yield-under-conventional-and-organic-cropping-systems-with-recommended-and-high-inputs-during-the-transition-year-to-organic/). Soil health has recently captured the attention of farmers in the U.S. and internationally, yet there are many applications that expand beyond the field of agriculture. The green urban landscape has great potential for improving soil quality. In city parks and greenways, compaction from both human and machine activity, and the mixing of topsoil and subsoil during routine park maintenance can affect soil functions such as plant growth, water infiltration, and the support of biological life. Although soil degradation is visible in many parks, a systematic approach to characterize soil health has only recently been applied to urban landscapes. Cornell University’s Comprehensive Assessment of Soil Health (CASH) provides an assessment of soil health relative to important soil physical, chemical and biological processes. In both rural and urban settings, chemical indicators such as pH and macro/micro nutrients are often at optimal levels due to lime and fertilizer applications, yet the soil itself can still be physically and biologically degraded. CASH provides a full picture of what’s going on below the surface. It outlines the interconnected processes causing constraints, which in turn empowers land managers to make informed decisions about soil amelioration and future maintenance. By promoting urban soil health, cities can create positive environmental outcomes such as flood protection, groundwater recharge, and sequestration of dust and carbon, while providing a more comfortable urban climate through healthy plants. 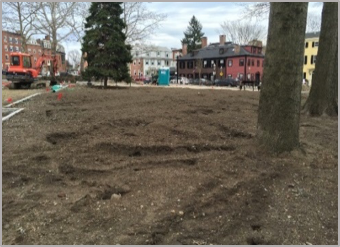 Recently, CASH was evaluated as a tool for a renovation project in Boston, Massachusetts, which is a notable example of the application of the test for soil health management in city parks. Pocket parks (or mini parks) play an important role in city life, whether it’s sitting on a park bench, strolling through a bit of green in an urban jungle, or the neighborhood kids playing a game of kickball. These small parks, sometimes no larger than ¼ acre, provide a safe and inviting environment for community members. They support the overall ecology of the surrounding environment, landscape and heritage, and empower local residents to make decisions that affect their community. Boston has hundreds of these outdoor parks all over the city, and one of the oldest and most beloved is Charlestown’s Winthrop Square Park. 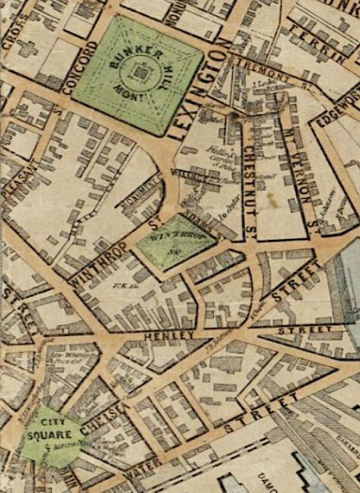 Figure 1 1852 McIntyre map of Boston showing the Training Field in relation to City Square and the Bunker Hill monument. By this time the Training Field site was becoming more park-like. Photo taken from the Cultural Landscape Plan for Winthrop Square Park. The park, also known as the “Training Field”, is a .89 acre green space with a 400 year history. It was a training ground for colonial militia in the 1640’s, was witness to the Battle of Bunker Hill in 1775, served multiple functions as a civic space throughout the centuries, and most recently became a hotspot for Charlestown residents and a stop along the Freedom Trail. Although this space is deeply significant to the community and the city itself, it has been many years since restorations took place. Along with other much needed rehabilitation work, it faced drainage and erosion problems, and the overall soil health was lacking in many areas. The park renovation project developed out of a cultural landscape report, prepared by Kyle Zick, Landscape Architect, and Shary Page Berg, Landscape Preservationist, in partnership with two local community groups, the Charlestown Preservation Society and the Friends of the Training Field. The Boston Parks and Recreation Department led the way and a park renovation proposal was approved by the City, along with $690,000 from its Capital Budget. Sherzi & Company LLC was part of the consulting team brought in to address the drainage and soil health issues at the site. Owner Chuck Sherzi had extensively used the CASH approach in previous projects, and recommended to employ this holistic approach to address the concerns facing the park. The complete diagnostic report included data analysis and interpretations from the Cornell Soil Health lab, site observations, and a detailed summaries of suggested recommendations and appropriate construction materials. Since the site is naturally divided into six unique areas and each had a specific set of challenges (foot traffic, grade elevation, water flow, etc. ), separate soil samples were collected from each area (Figure 2). The CASH approach emphasizes the integration of soil biological, physical, and chemical measurements. These include soil texture, available water capacity, soil penetration resistance (compaction), wet aggregate stability, organic matter content, soil proteins, respiration, active carbon, and macro- and micro-nutrient content (see soilhealth.cals.cornell.edu/ for more details). The results are synthesized into a comprehensive soil health report with indicator scores, constraint identification, and management suggestions. The report can be used by consultants and managers as a baseline assessment and to guide soil amelioration and future management. Aggregate stability (indicating soil resistance to disintegration from rainfall) and available water capacity (indicating the soil’s ability to store water) scored high on all six assessments, possibly a result of minimal soil disturbance at the site over the years. Surface (0 – 6 inches) and subsurface (6 – 18 inches) hardness (indicating compaction that limits root growth, water transmission and plant access to nutrients and water) scored mostly low and medium throughout the site. The indicators generally scored medium or low, suggesting marginal soil biological activity. Although several areas tested within range for total organic matter, active carbon was constrained at four sites, indicating a lack of biologically available food and energy within the organic matter. All six areas scored medium in the root health rating, most likely due to compaction. pH and minor elements scored low or medium in five of the six areas. Heavy metals in all areas were found to be within the allowable concentrations for garden soil and were therefore not a concern for this project. Area 5 was the second largest of the areas assessed, experiencing a high amount of foot traffic and patchy consistency throughout. 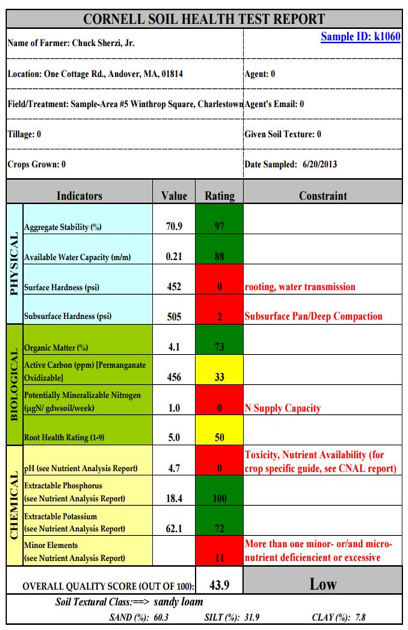 It had the lowest soil health score, with the major constraints being surface and subsurface compaction. While the organic matter scored high, other biological indicators were relatively low. The sandy loam texture could be a factor in the loss of nutrients through leaching, and the low nutrient base cations Mg++ and Ca++ could be associated with a low pH. A layered approach was proposed for Area 5 and all other areas assessed. Results of the assessment highlighted soil compaction as the major underlying constraint common to all six of the Winthrop Square areas. Issues with the physical structure of soil eventually leads to negative impacts of both biological and chemical components. Compacted soils have decreased pore space that can limit infiltration, increase runoff and erosion potential, and allow for anaerobic conditions that are unfavorable for beneficial microbial communities. They can also limit plant access to nutrients and water. Given these results, recommendations for the site were focused on decompaction measures followed by incorporation of organic amendments to improve nutrient cycling, pH, and the overall biological health of the soil. Sherzi also recommended amending the sandy loam soil with biochar and a green manure to break up the surface hardness, aid in nutrient retention and further prevent runoff and erosion. Figure 4 Air spade used to aerate and break up soil at Winthrop Square Park. Air Spading: Useful for tree root collar work and excising of girdling roots. 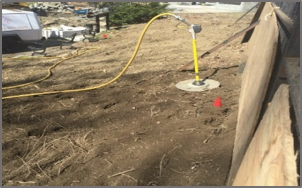 The specialized tool uses compressed air to dislodge, breakup, and aerate compacted soil. Soil amendments are then added and “stirred” into the existing soil using the air tool. Figure 5 Example of vertical composting. Vertical Composting: Utilizes air tools to open up holes in the soil along a predetermined grid pattern in turf areas. Soil amendments are then added to these holes and graded over. The compaction layer is slowly broken up by the microbes as the holes begin to coalesce, reducing compaction and improving the overall soil health. Figure 6 Radial trenching pattern around tree at Winthrop Square. Radial Trenching: much like the root collar technique, this approach works on a pattern of trenches, radiating from the trunk of the tree, either dug by hand, by machine or by air tool. Soil amendments are then added to help stimulate fibrous roots of the tree. In addition to the physical decompaction work, incorporating organic matter, both dry and liquid, was critical for maintaining balanced soil biological communities. Dry and liquid soil amendments used in conjunction with the de-compaction work: compost, calcitic lime, bio-char, fish hydrolysate. Potential long term management solutions for the park include top dressing with compost, adding fertilizer, limestone for pH, and fungal foods, grass mowing at 3.5-4” height, and keeping pedestrian foot traffic on walkways. An irrigation system was installed along with moisture sensors to determine proper watering amounts. The Winthrop Park Project is scheduled for completion in summer 2016, including attention to the hardscape –new concrete, relining the ‘Freedom Trail’, fencing, etc. 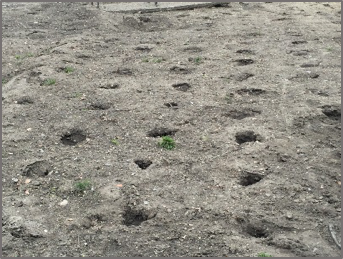 CASH, with its site-specific soil health analysis and holistic management approach, proved to be effective for soil testing in the urban environment. 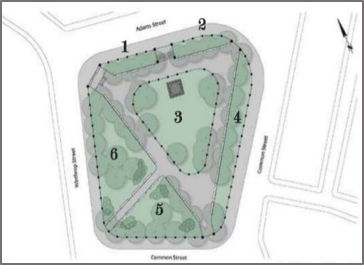 Using this method, a cherished piece of green-scape for the Charlestown community set an example for how cities can approach future soil health monitoring in city parks. For more information about CASH, please visit soilhealth.cals.cornell.edu. For more information about the project contact Chuck Sherzi Jr. at csherzi@comcast.net. Meadow fescue is grown extensively in Canada and Europe, but dropped out of use in the USA decades ago primarily due to reduced yield and disease susceptibility, compared to other grasses. Primarily grown for pasture use, meadow fescue has considerable potential in mixture with alfalfa. Alfalfa-grass mixtures are as high or higher yielding than pure alfalfa, and have been shown to be an excellent forage for lactating dairy cattle. Meadow fescue has higher fiber digestibility (NDFD) than most other grasses, consistently 2-4 percentage units higher than tall fescue. Feeding trials across the USA have shown that a one percentage unit increase in NDFD increases milk production by 0.5 to 1.0 lbs/cow/day, and more than 1.0 lb/cow/day for the highest producing cows. Meadow fescue in combination with new reduced-lignin alfalfa varieties can produce a very high quality forage for lactating dairy cows. A somewhat reduced yield potential for meadow fescue may actually be advantageous for alfalfa-grass mixtures, where a grass percentage of < 40% is desirable. Meadow fescue prefers deep, rich soils, and while surviving in wet soils, it cannot tolerate flooding. It will survive under dry conditions but is more sensitive to drought than many other grasses. It can be grown in areas suitable for timothy, and is considerably more winter hardy than tall fescue in northern environments. Meadow fescue is closely related to both tall fescue and ryegrasses, and a number of hybrids have been developed using various mixtures of meadow fescue, tall fescue, and annual and perennial ryegrass (festuloliums). Festuloliums vary widely in appearance, winter hardiness, and forage quality, due to the relative proportions of fescue and ryegrass in the hybrid. In mixture with alfalfa, meadow fescue should be seeded at 4-5 lbs/acre in either the spring as early as possible, or late summer about 4-5 weeks prior to first freeze. Meadow fescue often contains a naturally occurring endophytic fungus, but unlike the tall fescue endophyte, no harmful alkaloids are produced. Meadow fescue cannot be infected by the tall fescue endophytes, so there are no concerns of livestock disorders with meadow fescue. 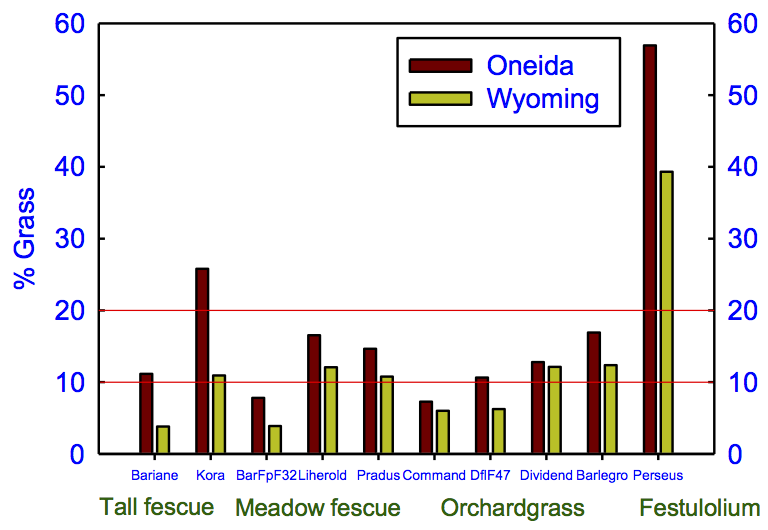 We established seedings of 10 grasses (meadow fescue, tall fescue, orchardgrass and festulolium varieties) in binary mixtures with 2 alfalfa varieties in spring 2015 in Oneida and Wyoming Counties. We thank Dave Curtin/Curtin Dairy and Dave Russell/Southview Farms for providing study sites. Optimum rainfall throughout the 2015 season resulted in abundant growth, and three seeding-year harvests were taken at both sites. Optimum rainfall also benefited grasses over alfalfa. Although all grasses were seeded at the same number of pure live seeds/square foot, the seeding rate was clearly too high for this particular festulolium (Fig. 1). ‘Perseus’ is a ryegrass-type of festulolium, with rapid, aggressive growth. Our seeding year goal is at least 10%, but no more than 20% grass, in a mixed stand at the end of the seeding year. Fig. 1. Grass% in spring-seeded alfalfa-grass mixtures in Sept., 2015. Spring of 2016 was abnormal, with cold, dry weather. This had much more impact on alfalfa development than grasses, which flower in response to day length. The cold spring weather resulted in immature, very low fiber alfalfa forage under 30% neutral detergent fiber (NDF) and a little over 30% crude protein (CP) when harvested the last week of May, while NDF of grasses was generally optimum in the low 50’s. Meadow fescue headed out between May 26 and June 1, 2016, depending on variety and location. Tall fescue and festulolium had a similar heading date range, while orchardgrass varieties headed a few days earlier. About half of the grass varieties were at an early heading stage at spring harvest. Between 20 and 40% grass is desired for years after the seeding year. Both sites have fertile soils and, in spite of the weather conditions the first two harvests of 2016, averaged a total of 4 tons dry matter/acre. 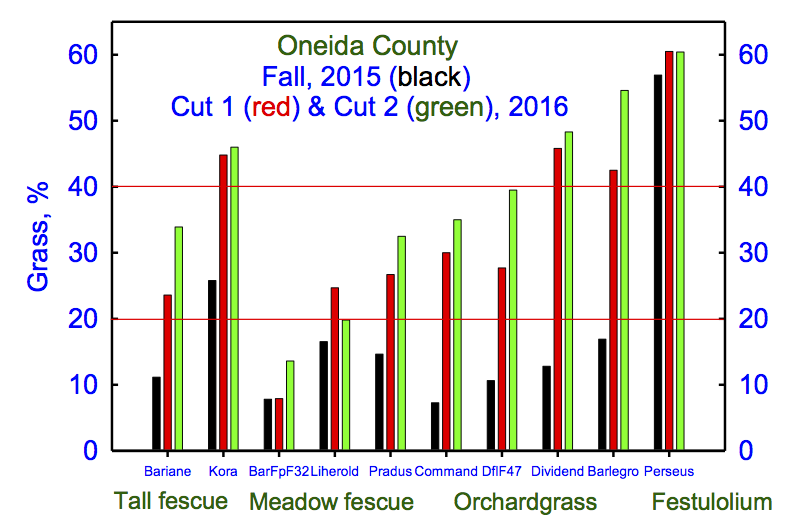 With somewhat adequate rainfall at the Oneida County site, grass% was stable or increasing (Fig. 2). 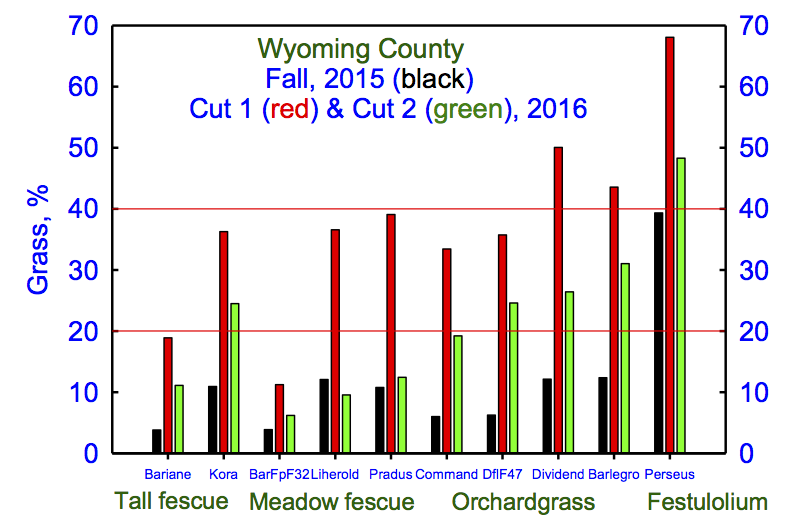 Less rainfall on a soil with less water-holding capacity resulted in a large decrease in grass% from Cut 1 to Cut 2 in Wyoming County (Fig. 3). The relative ranking of grass% among varieties was generally consistent over locations, but environmental conditions significantly impact all grasses. One exception was meadow fescue, which was more negatively impacted by drought than other grasses (Fig. 3). For spring harvest 2016, alfalfa averaged 57% fiber digestibility (NDFD48h) over both sites, much higher than normal. Grass fiber digestibility averaged a little over 80%. Perseus festulolium was 85% NDFD over sites, not different from the high digestibility selection BARFpF32 meadow fescue (selected from ‘Hidden Valley’) which was 84% NDFD. All other varieties were significantly lower in NDFD. The other two meadow fescue varieties were similar and averaged 80.5% NDFD. Tall fescue and orchardgrass entries were under 80% NDFD. Fig. 2. Somewhat adequate moisture kept grass% relatively stable from Cut 1 to Cut 2. Fig. 3. Dry weather greatly reduced grass% from Cut 1 to Cut 2. Fig. 4. Alfalfa provides nitrogen for grass in mixtures. 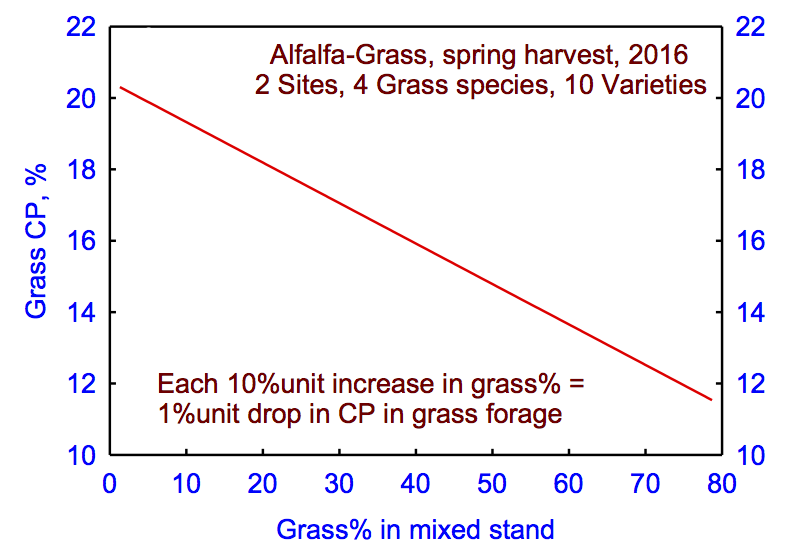 As the grass% increases in a mixed stand, there is less nitrogen available to grass from alfalfa, and also more grass requiring the limited available N. As the high CP alfalfa% decreases, grass CP greatly decreases (Fig. 4), and total mixed forage CP decreases. There has been a meadow fescue seed shortage in the USA the past couple of years. Meadow fescue originally came from Europe, with over 50 varieties in Europe, and the number of varieties available in the USA is rapidly increasing. There are at least a dozen varieties now available in the USA, as well as mixtures of different varieties, and a number of “variety-not-stated” seed sources. Since varieties originate from a wide geographical range and differ in forage quality, it is best to pick a certified, named variety. Mixtures of meadow fescue varieties or variety-not-stated seed may contain completely different varieties next year, even when purchased from the same seed company. Grass% in mixed stands will be strongly influenced by environmental conditions. Ryegrass-type festulolium is vigorous and aggressive, requiring considerably less seed per square foot than other grasses. 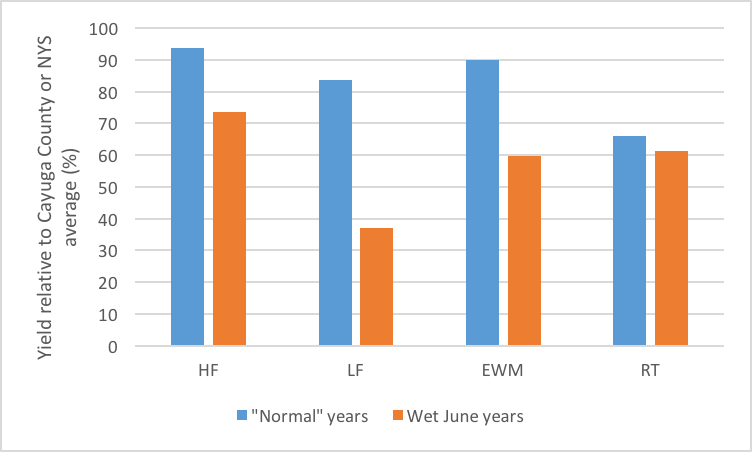 Optimum grass growing conditions through 2015 and the early spring of 2016 resulted in very large increases in grass% for most varieties, while prolonged dry conditions at one site greatly reduced grass% at second harvest in 2016. The high digestibility BARFpF32 meadow fescue has not become a significant component of the mixture, while other grasses exceeded the optimum proportion in the mix. Further studies are warranted using high quality meadow fescue and festuloliums in mixture with reduced-lignin alfalfa types to determine best management practices.